The magical island of Kefalonia - also known as Cephalonia - is one of Greece's most beautiful Islands. Every year, tens of thousands of tourists from all around the world visit its shores to experience some much needed sun – but the reason that so many come back over and over again, is the beauty. 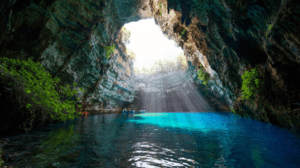 Kefalonia is one of the most beautiful islands in the world. Stunning pearly blue sea, vividly green fields and lush green fir-capped mountains reach high up into the clear sunny sky. From its capital Argostoli, sitting on a large southern bay, to Skala in the southeast and Sami on the east coast, the island’s towns owe their modern look to that 1953 earthquake. Fiskardo in the north, was relatively untouched, and has a little more history. Reborn from the ruins with new buildings and a new style that is wonderful, especially when complimented by the beautiful weather and clear blue sea that encompass the island. 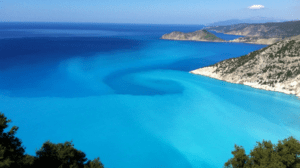 Kefalonia is a large island and despite its growing tourist industry, it never seems crowded. No island in Greece offers the same feeling as Kefalonia and no matter how close they may lie; Kefalonia stands alone as a unique holiday experience. Myrtos, the most famous and pictursque beach in Europe. A must, stop and savour the maginificent views to your heart's content. Argostoli the capital stands across an inlet, its two parts connected by the Draponi Causeway, semi-sunken bridge. Argostoli has museums (of history, archaeology, folklore). 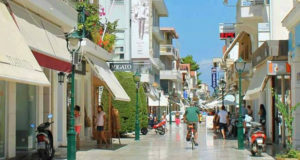 Plenty of shops , tavernas & coffee shops , something for everyone.